Quick, high quality work done on-site. ​Get 2 to 3 day turnaround on band and orchestra repairs. Questions? Call us at 920-725-9000 and we'll be glad to help. 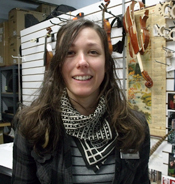 Erin Alderson has been repairing orchestral instruments since 2005. Erin has amazing repair skills and is a master at attention to detail. From bridge set ups and open seams to restoration projects, Erin can get the job done. Randy Stinski is the owner of Island Music and a brass and woodwind repair technicians and band instrument specialist. A graduate of Red Wing Technicial Institute (1983), he brings many years of experience and knowledge to our technician team. Carl Garrow has over 30 years of electronic repair experience in the Fox Valley. From vintage tube amps to electric pianos, Carl has the knowledge and expertise to repair your instrument in a timely manner. 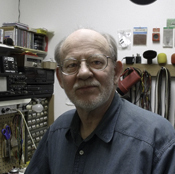 With Carl's talent, Island Music is your resource for all electronic repairs. Don Engle has been with us since 2009. Don graduated in 1999 with a degree in instrument repair from Red Wing Technical Institute. He has more than a decade of experience repairing brass & woodwind instruments. James Olson has been repairing instruments at Island Music since 2010. James has over 10 years of experience in instrument care and repair. 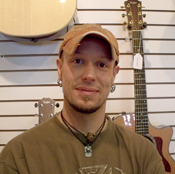 From re-strings to electronics repair, James has the expertise to complete your projects. 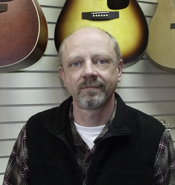 He has been playing guitar for over 25 years and has a vast knowledge of various makes and models of instruments.